Alex Ziebart on WoW Insider confirmed today that WoW Insider will cease operations this Tuesday, February 3. This is definitely a sad day. This follows Alexander Sliwinski reporting on a rumor that Joystiq was shutting down on Joystiq itself three days ago. With them goes Massively as well. 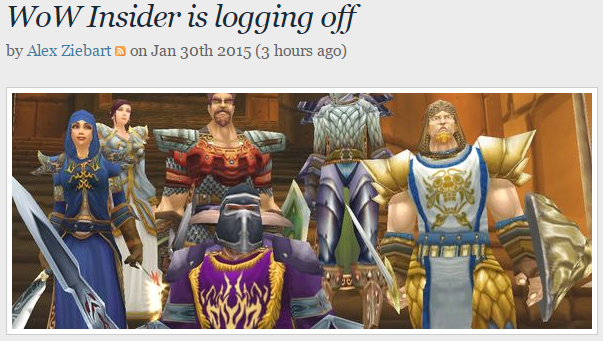 WoW Insider was my favorite source of World of Warcraft news. There’s a void now, and I’m not sure how I’ll fill it. There are many other WoW blogs I follow but none like WoW Insider. I’m open to suggestions if anyone has any! Many talented persons have written for the site, including some of my favorites like Dawn Moore, Anne Stickney, Fox Van Allen, and Olivia Grace (even if the last two weren’t writing for it recently). I wish I was better at using Twitter. I feel like things I might want to read get lost in the never-ending stream, but I’ll follow all the writers regardless. I’ve written three pieces for WoW Insider too. In my Breakfast Topics, I posed the questions, how do you relationships in game affect relationships in real life, are you a closet reoleplayer, and has your perspective of Azeroth changed over time? I’ve also responded to Breakfast Topics here on Kor’kron 501st. In fact, you can tell how much influence WoW Insider has on me by checking the WoW Insider tag on my blog. How will I know my lore without Know Your Lore articles? Most importantly, what about the Queue? The Queue is the daily column in which various WoW Insider writers answer questions from the community. It was by far my favorite column. Every morning I check for the Queue, and when it’s not yet posted, I keep checking until it is. It’ll be weird for it be gone. Farewell, WoW Insider, and thanks for everything. Realization, Anna, Too Many Annas, 1/9/13. I should have posted this last week. I’m in agreement with a lot of this. I don’t have time to do everything Blizzard wants me to do, and I miss the idea of finishing everything I needed to do for the week and just being done. Know Your Lore: Hands drenched in blood, Anne Stickney, WoW Insider, 1/13/13. A fantastic look at the lore behind the Blood elves and Lor’themar Theron. I’ve been really fascinated with the Blood elves recently, so I was very excited to see that Anne wrote this! Title says it all. I’m excited about this! Examining the tier 15 priest set bonuses, Dawn Moore, WoW Insider, 1/16/13. Good to know for priests! Patch 5.2 valor gear not tied to dailies, Olivia Grace, WoW Insider, 1/14/13. Patch 5.2 PTR: New notes from Ghostcrawler on tier 15 bonuses, other balance concerns, Adam Holisky, WoW Insider, 1/15/13. Might be good info. Then again, things might change. Patch 5.2: No flying mounts in the new zone, Adam Holisky, WoW Insider, 1/16/13. Flying does feel like skipping content, so I’m glad about this. Direhorn hunter pet in patch 5.2 is the triceratops we’ve been wanting, Olivia Grace, WoW Insider, 1/16/13. I need a hunter. Now. Rep Grinding with the Joneses, Bravetank, 11/20/12. A fantastic parody of what it’s like to grind reputation. Blizzard calls for Christmas craft, Olivia Grace, WoW Insider, 12/11/12. Time to step it up, crafters. Getting the Most Out of Disc and Spirit Shell, Derevka, Tales of a Priest, 11/28/12. A disc priest that’s not using Spirit Shell is not a good disc priest. Battle Pet Ability Guide, ReversionLFM, Looking For More, 12/5/12. When ReversionLFM couldn’t find an easy to read ability guide for Pet Battles, he made one. What raids will we see in patch 5.2?, Matthew Rossi, WoW Insider, 12/12/12. Zandalar Island? A mogu island? An underground mogu stronghold? Something else? Lots of speculation here. Are rogues a dying class?, Matthew Rossi, WoW Insider, 12/11/12. Rogues in sharp decline? Locks being played more? Challenge Modes could be coming to older dungeons, Olivia Grace, WoW Insider, 12/10/12. I’d like to say this would be really cool, but I’ve yet to do a Challenge Mode. Anduin Wrynn broke my heart, Dawn Moore, WoW Insider, 11/15/12. After everything they’d been through, Anduin acts like he doesn’t even know Dawn Moore! Grandpappy Frostheim on Why Burning Crusade Sucked, Brian Wood, WoW Insider, 12/13/12. Keep your nostalgia in check. Lon’li Guju, Reputation Grind, 11/21/12. His look at the Lonely George tribute. Boo-Boo Number Three, Cymre, Bubbles of Mischief, 11/23/12. Cymre attempt to trick her friend with a port to Old Dalaran. Know Your Lore: WoW for Dummies, Act I: Alliance, Anne Stickney, WoW Insider, 11/18/12. Why does she have to call us dummies?! Know Your Lore: WoW for Dummies, Act I: Horde, Anne Stickney, WoW Insider, 11/25/12. How is this Act I still? Know Your Lore TFH: The origins of the pandaren, Matthew Rossi, WoW Insider, 11/21/12. What’s the relation between pandaren of Pandaria, the pandaren of Northrend, and the furbolg? Know Your Lore: The Yaungol, Matthew Rossi, WoW Insider, 12/12/12. A nice recap of their history. Know Your Lore TFH: Something is wrong, Matthew Rossi, WoW Insider, 12/5/12. The timeline is wrong if the Horde-Alliance conflict released the Sha. Know Your Lore, Tinfoil Hat Edition: The seventh Sha, Anne Stickney, WoW Insider, 12/9/12. Building on the “Something is wrong” KYL, Stickney speculates about the seventh Sha. Around Azeroth: Cub scouts, Elizabeth Wachowski, WoW Insider, 12/5/12. Let’s all be pandaren cubs! WoW Archivist: How forum trolls broke a CM, Scott Andrews, WoW Insider, 11/16/12. Gok’lokk’s Shell brings beauty to Pandaria, Anne Stickney, WoW Insider, 11/20/12. Now you can reenact the Birth of Venus! Frolicking merrily with Martar the Not-So-Smart, Anne Stickney, WoW Insider, 11/23/12. Because you’ve always wanted a gnoll sidekick. Patch 5.1: Treant Form now combustible, Chase Hasbrouck, WoW Insider, 11/28/12. Why would we want to set our trees on fire? Death knight Mionee solos Madness of Deathwing, Anne Stickney, WoW Insider, 12/9/12. I guess we all knew this was coming eventually.